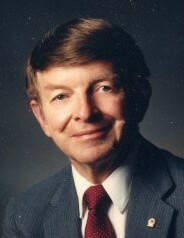 Ralph Jennings Carlson was the picture of health and independence with a busy schedule and working fulltime until he passed peacefully after a fall. At age, 89, he enjoyed a sweet reunion with his wife, Catheryn, who died in 2000. Ralph was the proud father of R. Steven (Susie) Carlson, Brent Jennings (Tami) Carlson, Lloyd Carlson, Rex (Brenda) Carlson, Julie (John) Culverwell and Jana (Dewey) Kettering followed by 15 grandchildren and 11 great grandchildren. He was born in 1929 to parents Arthur Jennings Carlson and Lizette Russell Carlson. He is survived by his sister Phyllis Bennion. Ralph never held back from trying or being first at something as his upbringing required ingenuity and strength. He grew up on small farm on 3300 S. and 700 E. farming and ranching. He worked alongside his parents who taught him how to work. After his father’s double leg amputation, the kids ran the farm and his mother became a Rosie Riveter to make ends meet. They ate only what they grew or raised but were generous to others during tough times. They would often sit and listen to his grandpa’s radio – which is where Ralphs’ love for radio emerged. He also loved riding his horse, King, while his dogs, Brownie and Shep, ran along side. Ralph graduated from Granite High School in 1948 and attended the University of Utah. Ralph and Catheryn and their kids owned and operated nine radio stations in Utah, Idaho, Nevada and Arizona including, KRSP – Rock 103, KUSW Short Wave, KDYL, KRJC Elko and KCYN Moab. He was supported by his long-time loyal friend and coworker, Kris Trout. Running the stations was a family affair that spanned more than 50 years with many of their kids working in radio. He and his brother, Arthur, owned A & R Meats and began the radio stations to promote their products. He was a small plane pilot and one of the first hot air balloon pilots in Utah. He flew the A & R Big Dog balloon all over to promote the company. Among his many awards, and as a pioneer in the broadcasting industry, he was inducted into the Utah Broadcasters Hall of Fame and received the Silver Medal Award from the Utah Advertising Assoc. Ralph was at his best setting up and participating in numerous Exchange Clubs around the Salt Lake Valley and attending national conferences with family in tow. He was very active in the community and held more positions that we can list here. He was active in his church callings. He and Catheryn where instrumental in getting Cub Scouts in his church and later he received Scouting’s Silver Beaver Award. He was prolific at writing poetry. Ralph was always on a course of self-improvement, had many varied experiences in life, community, church and work. He was very patriotic and served in the Army during the Korean War while based in Japan. He was honored to be part of the Honor Flight program. He has always flown a flag in his yard and recalls playing his trumpet as a child when raising the flag. Despite a knee injury during the war, he continued skiing and hiking and became quite a runner, running consistently up until a year or so ago. He ran 37 marathons and hundreds of other races. At age 72, he also climbed the highest peak in every county in Utah in preparation for climbing Mount Kilimanjaro (19,341 ft. above sea level) with his son Rex. He was proud that he taught all of his kids to ski, had a loving marriage, built his homes, built many businesses and won many races. But perhaps his greatest achievement was how lovingly he cared for and supported our mother who suffered from Alzheimer’s disease for nearly 10 years. He pushed her in a carrier during his morning runs each day so that she could breathe the fresh air and enjoy nature. He took her to church and work and to community events well into her illness. It was truly such a strong symbol of their love. He was a kind, generous and inspiring man that had boundless energy and devotion to the things that he believed in. Thanks to those of you who continued to remember our Dad in his later years. He had a sharp mind until the end and not a single chronic illness as testament of how well he took care of himself. Today, in honor of Ralph, please exercise, fly a flag or turn on a local radio station. Ralph will be remembered at a service at the Church of Jesus Christ of Latter Day Saints, 895 West 4800 South. Ralph’s funeral will be held on Wednesday, February 13, at 12:30 p.m. The funeral service will be preceded by two viewings: One on Tuesday, February 12 from 5:30 - 7:30 p.m. and another one at 10 a.m. – Noon prior the funeral on Wednesday. He will be interred at Redwood Memorial Estates.